Last Dec 2016, I was collecting music for Wind Horse Records’s first label showcase in Goa called “Neon Grooves”. I was on traxsource hunting for music and somehow i came across a track called Piano by Third Deck. This track was really driving almost like a techno track but i was really musical and had an amazing latin jazz piano riff tucked underneath it. The combination was so good that it was scary! I started listening to the catalog of Third Deck and realized that some of the tunes were really disco and funky influenced and than some of them were really driving but with a jackin edge. It was stylistically a bit different but i bought the tracks and played them at Antares in Goa where we were hosting our label night. Boy oh Boy, what a vibe. I played “Piano and “Warehouse Loops” and what a feel. It was a feel good but edgy and hip feel and it got goose bumps everywhere. In Addition to me feeling high, the crowd started dancing in a different way and the energy picked up big time. After this night i play these tracks regularly and its always the same reaction. It always feel like a fresh wave of energy just appeared from nowhere. Recently I bought another track of Third Deck called loop affair and this time the vibe is super tribal. This tribal but driving track seems like an evergreen peak time track as its produced with the perfect balance that make it seem different but yet connects us to vibe that is familiar. I would totally recommend going through the entire catalog on traxsource. Totally Worth it! I would like to take my hat off to “Third Deck” who’s bio i cannot find online but it seems there is connection to Tommy Largo (The jackin house legend from the Netherlands). 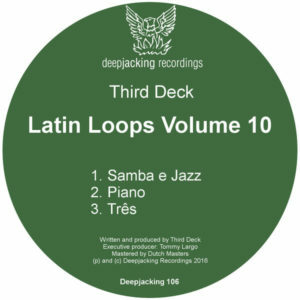 Would also like to show respect for the label “Deepjacking Recordings” for putting out these amazing tunes by Third Deck.